Elegantly designed for the traditional home, the Croydon Collection masterfully blends classic touches to create a seating offering that will be the perfect fit for your living room. Carvings are finished in a rich cherry and feature gold tipping for an added touch of elegance. The show wood frame defines the profile of the collection while toss contrast pillows complete the look. 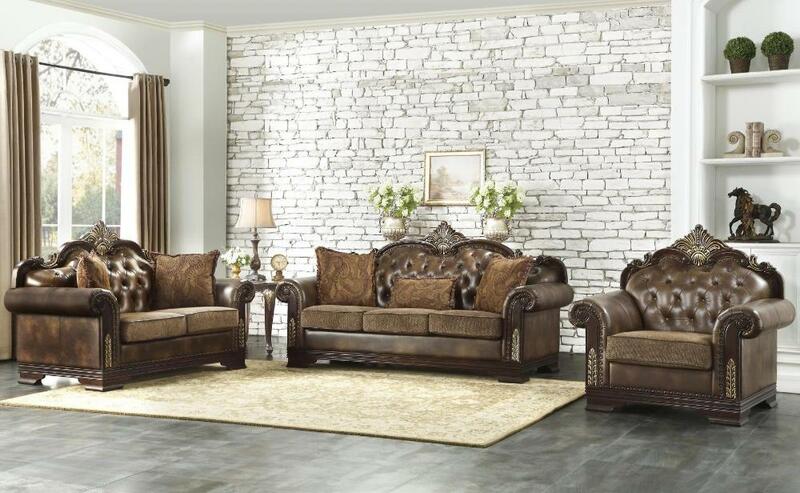 FEATURES: Brown Color ~ Traditional Style ~ Rich Cherry Carvings / Gold Tipping / Show Wood Frame Accents ~ 100% Polyester Fabric & Bi-Cast Vinyl Cover ~ Reversible Seat Cushions ~ Button Tufting Backs ~ Toss Pillows.